The Kingdom of Saudi Arabia KSA is the largest country in the Arabian Peninsula in terms of area. It is also one of the wealthiest countries in the world in terms of money. No one can doubt the importance of the kingdom. Nonetheless, up until recent years, the tourism sector in the country was limited to Hajj and Umrah, strictly religious tourism. And starting in 2017, everything began to change. We have started seeing projects like Al Ula Project, Qiddiya Project and Red Sea Project take place in KSA. Can the kingdom really be turning into a tourist destination? One of the major factors for the change is the economy. Saudi Arabia is an oil-based economy. The Kingdom has the second largest reserves and is one of the major exporters of petroleum in the world. The petroleum sector in the country accounts for around 75% of budget revenues, 45% of GDP, and 90% of export earnings. However, Vision 2030 or the new vision for the Kingdom of Saudi Arabia aims to diversify this oil-based economy and create more job opportunities. And no matter how far-fetched tourism seems like a choice for the kingdom, apparently it was one of the country’s first choices to diversify that economy. One of the main goals of the new projects in Saudi Arabia is to attract Saudi people to spend more vacations in Saudi Arabia, have more fun at home and spend less money on vacations abroad. Vision 2030 aims to encourage people to spend the share of household spending that goes to family entertainment in-house. The projects aim to serve more than 50 million visitors annually, both local and foreign visitors. Let’s take a look at the projects and the steps taken to turn KSA into a tourist destination. Saudi Arabia has launched on a massive project called Qiddiya Project or Qiddiya City. The country plans to build a mega cultural, sports and entertainment city in Al-Qiddiya, southwest of the capital Riyadh. The gigantic development, located 40 km from the city center of Riyadh, will include a wide range of entertainment facilities. 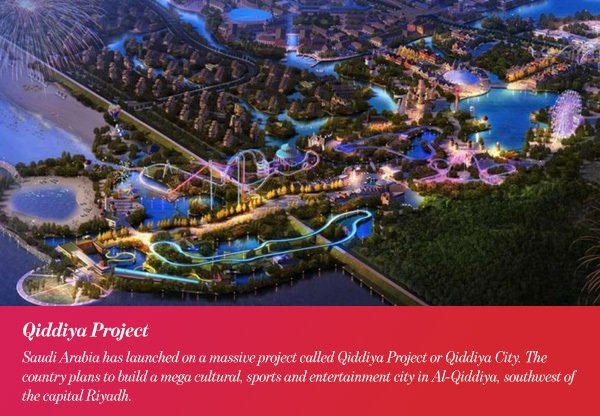 Visitors to Qiddiya Project will enjoy six groups of entertainment facilities: amusement parks, sports facilities, car and bike racing areas, snow and water parks, natural attractions, and cultural and heritage events. Work on the project has started in 2018 and Qiddiya Project is set to open to the public in 2022. The main objective of the project is to provide an extraordinary entertainment destination for Saudi people. It is expected to create more than 22,000 jobs in the Kingdom by the end of 2030. The Qiddiya Project is one of the most major investment initiatives supporting the Kingdom’s Vision 2030. It is set to become a prominent landmark in Saudi Arabia as well as an important recreational, cultural and social hub. The Red Sea Project is one of the most prominent parts in the big plan to diversify the economy. Creating a new image for Saudi beaches as a place for sun and fun, this project presents a new adventure to the kingdom. Authorities are already relaxing rules on entertainment, concerts and film screenings have drawn thousands of people over the past year, and generated a very nice revenue. So, beach resorts are a logical next step; especially considering that the kingdom already has an abundance of sandy shores across the Red Sea. 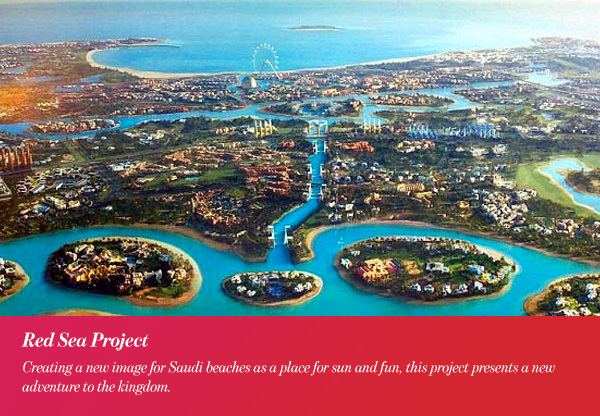 The Red Sea project is specifically planned to release the potential of the marvelous KSA coastline over the Red Sea. Spread over 125 miles of golden seashore and across 50 islands overlooking the spectacular Red Sea reefs, the development will include various hotels and high-end residences. The initial groundbreaking is expected to commence in the third quarter of 2019. And the first phase of the project is due to be completed by the fourth quarter of 2022. The first phase comprises all logistical infrastructures including air, land, and sea transportation as well as the development of hotels and luxury residential units. In addition to the wonders of the Red Sea, the project also aims to attract tourists to historic and natural landmarks in adjacent areas such as the ruins of Madain Saleh, which a UNESCO world heritage site, and a nature reserve where visitors can explore the area’s flora and fauna. The Red Sea Project is expected to create around 35,000 jobs and contribute 15 billion Saudi Riyals to the nation’s GDP when it is completed. As part of the ongoing plans to transform the country into a globally renowned tourism destination, Crown Prince Mohammed bin Salman has launched a mega project in the mountainous region of Al Ula. This mega project includes resorts, tourist attractions, and a natural reserve. It aims to attract 2 million visitors to Al Ula area by 2035, and also to create 38,000 jobs by that time. Al Ula Project will spread over an extensive area of more than 22,000 square kilometers of land north of Madinah. It will feature the Sharaan Natural Reserve as well as a very luxurious adjacent resort. Al Ula region is renowned for its sandstone rock formations, and for being the archaeological site of Madain Saleh, which is the largest Nabatean settlement south of Petra. 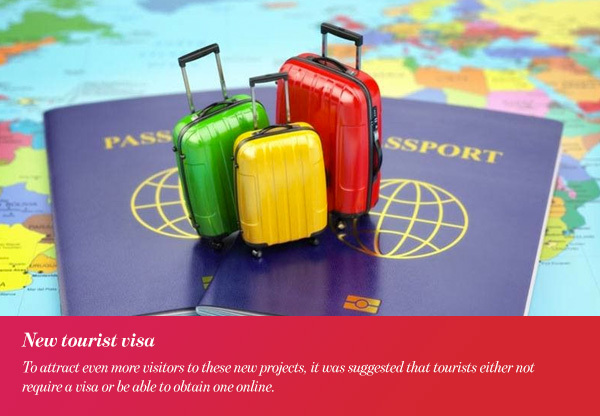 To attract even more visitors to these new projects, it was suggested that tourists either not require a visa or be able to obtain one online. The government, however, has issued a statement saying that there will be a new tourist visa to Saudi Arabia. The Saudi Press Agency (SPA) has reported that all details about the new tourist visa will be announced in good time. And that arrangements are carried out to lay down the standards on which the issuance of the tourist visa regulations will be based. The Saudi Commission for Tourism and National Heritage (SCTH) will announce those details after the approval by the commission’s board of directors. SCTH is currently preparing to launch the tourist visa in coordination with the ministries of interior and foreign affairs. 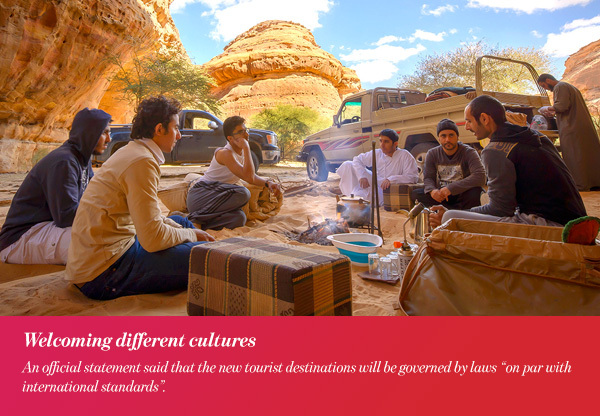 The trending question regarding this issue in the global media nowadays is this: Will the restrictive Saudi laws accept tourists from different cultures? Only time will truly tell. Nonetheless, all indications say that Saudi Arabia is moving towards a more accepting environment. An official statement said that the new tourist destinations will be governed by laws “on par with international standards”.